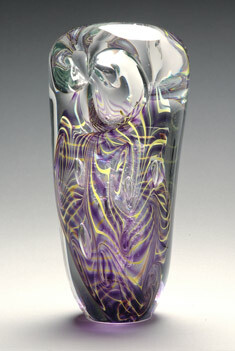 My work combines my admiration of traditional Italian and Swedish glass techniques with a modern American design sensibility. Often I will apply feathering, which is an ancient Roman technique, but instead of decorating the exterior of a vessel as it is traditionally done, I will encase the delicate pulls of color within several layers of clear, which both distort and amplify the interior pattern. This interest in optics was a key part of the early Swedish glass movement. The shapes I create and the color palettes I choose are clean, soothing, and organic, properties valued by modern American designers.